Being able to tell a story, whether it is a fairytale or taking 30 seconds to make a persuasive argument, is a skill that every person learns to master. Common to all mankind is the lobe of a good story. Whether sitting around a campfire, or getting lost in a great book, getting swept up in a narrative is a universal truth. But storytelling can take many forms and the ability to engage your audience, whether that is one person, a classroom, or an auditorium, being able to speak with impact carries you through all stages of learning and frankly, any life stage. This coming SXSW EDU, storytelling takes on many formats across many tracks. With session proposals on the topic doubling this year, storytelling is woven through a range of formats including Panels, Hands-On sessions, Workshops, Talks, and Future20s. 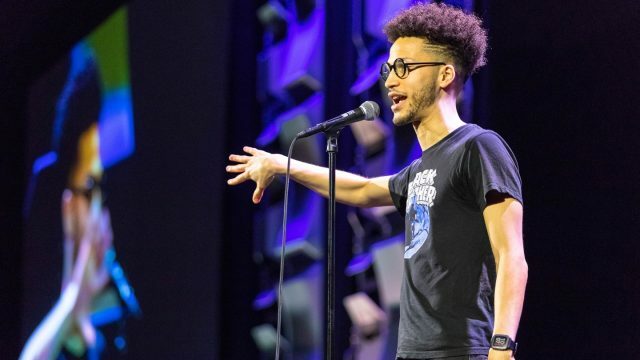 Following last year’s standing room only keynote, The Moth is back to help SXSW EDU attendees tell their story. Personal storytelling can play a key role in classrooms — connecting students to content, centering student voice, and developing essential skills. But how do we create the conditions for great storytelling? Co-founders and leaders of The Moth’s Education Program, Micaela Blei and Catherine McCarthy, will lead a lively, on-our-feet workshop for educators to brainstorm and craft their own Moth stories, as well as reflect together on classroom strategies, The Moth in the Classroom: Telling True Stories. More than ever, student voice and activism are emerging front and center. One area where this is critical is in the juvenile justice system. In the panel, Rikers: An Education Through Film, attendees will hear and see panelists combine discussion with clips from an upcoming PBS documentary. They will explore the intersection between film, education, and juvenile justice. By giving a platform to a formerly incarcerated young man, we hope to ignite a conversation that will demonstrate how storytelling through a kid’s lens can function as a learning device. In an informative and emerging tech workshop, Making Virtual Reality for Tomorrow’s Classroom, Kim Grenfeder (University of Miami), Elizabeth Miller (Concordia University) and Juan Carlos Zaldivar (Phonograph Films) will answer the question, “How can we as educators use VR to foster interdisciplinary learning and new media literacies?” As creators how can one ensure our content is relevant to a wide range of educational disciplines? This workshop is targeted to both content creators and educators. It will cover the production of VR projects across journalism, dance, theatre and ecology and offer practical advice on setting up a basic studio, scripting, sound design, and using VR as a teaching and research method. In this Talk focused on student agency, A Tale of Two Learners, attendees will hear the compelling story of two learners—a young man from Alabama who was good at the “game of school;” yet felt empty and disengaged. And, a young Iowan for whom school was a constant maddening struggle. At two ends of the “success” spectrum, neither was happy. Yet, through their unique journeys, they each discovered a new path that changed everything: learner-centered education. Join these young leaders to hear how they found their voices—and united to change the future of education for all learners. With so much more to explore, SXSW EDU attendees can participate in a master class on leadership, attend professional development programs, as well as hands-on workshops where they will learn how to deliver an exciting story in :60 seconds. Pixar will be leading a workshop that centers on using storytelling in project based learning and how narratives can support language learning. Throughout all of these engaging programs at SXSW EDU, storytelling in all of its forms is at the heart of engaging the audience inside the classroom and in the workforce. For more information about all of the amazing content being offered at SXSW EDU please visit the schedule. SXSW EDU 2018 photo by Rachel Luo.